What types of materials can I request? : Distance Education students are able to request book chapters and articles that the Himmelfarb Library does not presently own. Once we have received a PDF of your request, you will be sent a notification email in regards to where you will be able to access your PDF. Unfortunately, we are unable to ship books or any electronic formatted materials such as VHS, DVDs or CDs from other Universities to Distance Education students. I need to borrow a specific textbook. May I ask Himmelfarb to add it to its collection? Absolutely! If there is a particular title of a Medical text that you would like us to consider to add to our collection, please fill out a request form at http://himmelfarb.gwu.edu/forms/acquisition.cfm or contact Ruth Bueter at rbueter@gwu.edu. Are there other options? Additionally, if you would rather borrow a text book from another institution, you are more than welcome to request the book be mailed to you through the Consortium Loan Services. 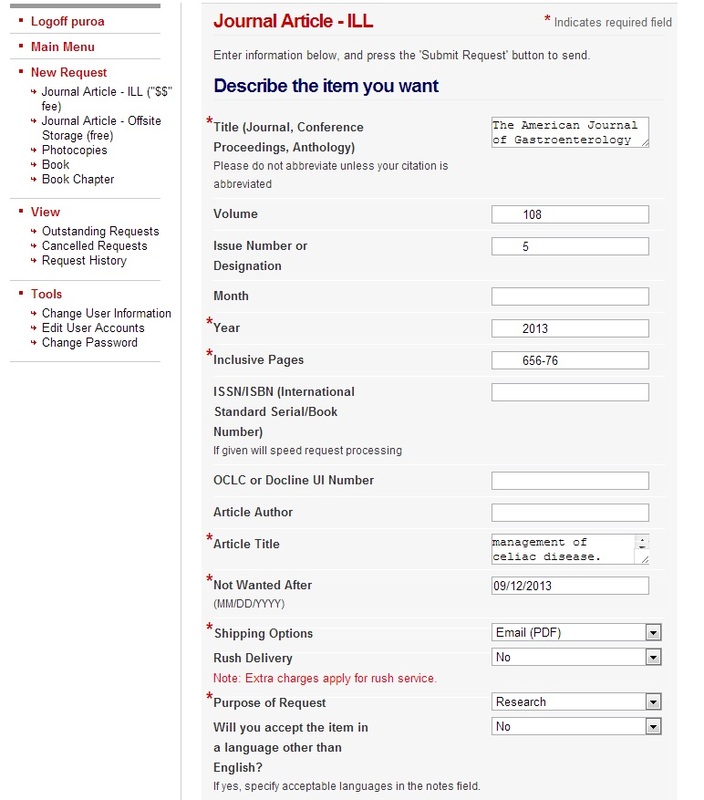 Requests can be made through the WRLC catalog. Go ahead and enter the title and once you have found the item you are searching for, hit the 'request' button, and login with your GW NetID and password. Important to note: You need to indicate your address in the "notes" field of the page provided for making the request. For returns, the items should be mailed back to the lending library, or if you are local, you may return the book to a Consortium library (as listed on the WRLC main website) that is convenient to you. If the material you need is not available through the Himmelfarb Library catalog, and cannot be requested through WRLC from any of the WRLC libraries, you're ready to try Documents2Go. Most requests are delivered within 24-72 hours. You may designate your request as "Rush" or "Urgent Patient Care," with guaranteed 24-hour delivery. Such requests incur an extra $10 charge; please indicate in your requests if you require this level of service. If you do not have a GW NetID, you can still log in to your ILLiad account as before. If you already have an ILLiad account, and its username is the same as your NetID, just log in with your NetID and password. You should be able to see your past transactions immediately. If you already have an ILLiad account, but its username doesn't match your NetID, log in with your NetID and password. Fill in your personal information to create a new account. Interlibrary Loan staff will connect your old account with the new one so you will be able to see your past transactions. If you haven't used ILLiad before, log in with your GW NetID and password, and fill in your personal information to create your account. *Make sure you select your correct status and affiliation with GW. *After entering a username and password, click on the 'submit information' button. First, make sure that the title is unavailable through either Gelman, or any WRLC library. 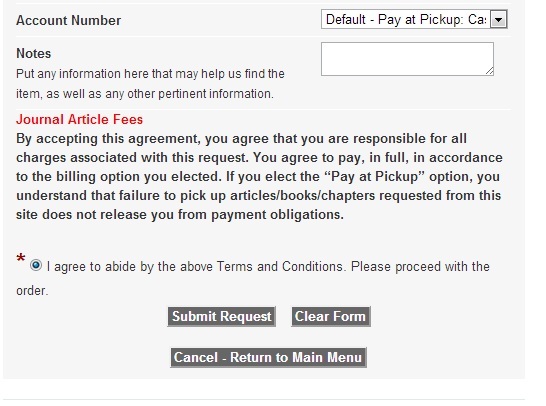 Once you've determined this, click on the "Request Interlibrary Loan via Documents2Go" Button. 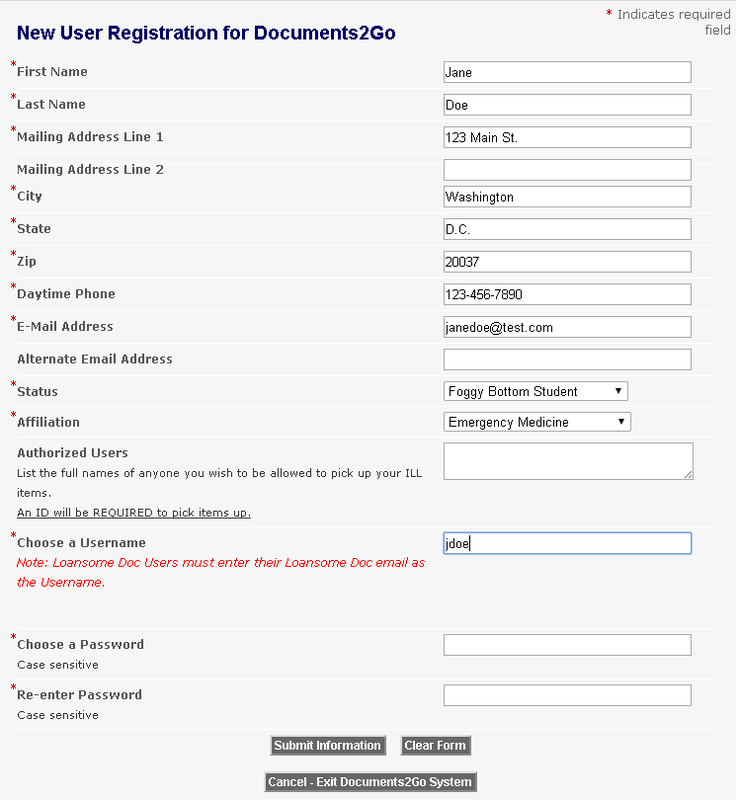 To submit a request, log in to Documents2Go and submit your request using our automated form. << Previous: Need Research Help?